Road Angel Vantage uses GPRS/GSM technology to automatically and wirelessly update the safety camera database every few minutes as you drive. Road Angel Vantage also displays the road speed limit on roads across the UK, whether a speed camera is present or not. Road Angel Vantage speed camera database warns to fixed safety cameras, mobile safety camera locations, average speed camera zones, black-spot areas, school zones, congestion charge zone and railway crossings with both an audible visual, spoken and audible alerts. Road Angel Vantage has been discontinued. Accessories are still available for your Road Angel Vantage click here. 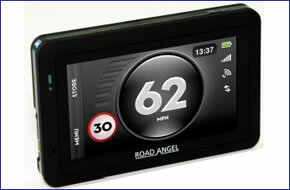 Road Angel Vantage is the cutting edge in speed management devices. In addition to the most accurate warnings of approaching safety cameras and road blackspots, new slim-line design, and improved user interface, Road Angel Vantage provides the most accurate road-speed information available, so drivers know exactly what the limit is, on any stretch of road they drive. Road Angel Vantage uses mobile phone technology that not only allows users to automatically receive regular updates to the safety camera database, and share the locations of LIVE safety camera vans, it also lets users make suggestions to new or revised road speeds. Called SpeedShare, this innovative technology utilises the vast Road Angel community to create an up-to-date, digital road-speed map of Britain. SpeedShare - feature that allows you to suggest new or revised road speeds. CameraShare - feature that allows you to share the locationsof LIVE safety camera vans. Road Angel Vantage is easy to install using either the provided windscreen mounting bracket or the dashboard pad, and powers directly from the cigarette lighter socket. Easily update your Road Angel Vantage with the supplied software. Subscription charge of £54.99 for one year, or £129.99 for three years required in order to receive updates to the safety camera and blackspot and road speed limit databases. Want to add accessories to your Road Angel Vantage?